The road erupted in a hail of gunfire as the soldiers of Oscar company, 3rd Battalion, The Royal Canadian Regiment (3 RCR), emerged in a pincer movement from the treeline and down the gravel road onto the enemy’s position on the riverbank. The fighting was intense, but it was over in minutes, and the company quickly reassembled for an attack on a target further up the road. For Captain Paul Mayne of Oscar company, the deliberate attack was an assessment of his offensive planning and execution skills and his ability to use his engineers, forward observers, artillery and other enablers as part of the Infantry Dismounted Company Commander’s Course (IDCCC), an annual exercise on the career path for officers, primarily Reservists, training to become company commanders. 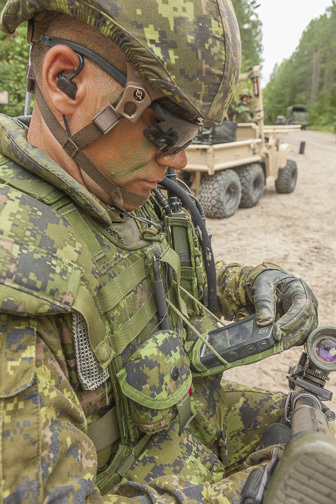 For most of the soldiers under his command, however, the exercise in the woods and over the back roads of CFB Petawawa was an opportunity to evaluate the capabilities of a new integrated soldier system suite (ISS-S) most had only received three weeks before. ISS-S, a project more than a decade in the making, will eventually network individual soldiers in a way that could significantly change how a company or platoon conducts operations. 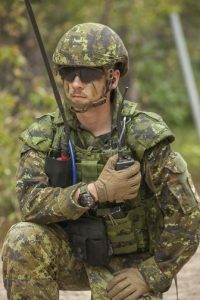 The Rheinmetall Canada system, known as Argus and introduced to 3 RCR in late July, is the first of three cycles, and provides enhanced digital communication at the platoon level with a tactical smartphone-like computer system, radio, and push-to-talk headphone, all networked across the formation. Already, after just a few weeks, it is starting to affect tactics. Without reservation, the soldiers of Oscar company had high praise for what the ISS-S enabled them to do, but the weight of the batteries and connectivity issues, as well as irritants like map icons and earbuds were causing periodic frustration. On the day, the company was connected across four networks, one for each platoon of 30 soldiers and one for the company, platoon and section commanders. Streaming data and communicating between, and even within, networks was difficult at times for many users. “It needs to be able to take in a lot more information, especially when it is trying to stream data from one system to all the other systems all at once,” added Shaver. He said the company had yet to test “going silent” and relying on digital reports and returns, but he noted that the usual process of providing and verifying a contact report could take minutes, while the ISS-S allows grid location to be shared in seconds. Both Gapp and Shaver noted issues with the battery technology; the fact that connectors insert straight in, rather than twist, and can also slip out; and the use of improper military icons on maps. But they said tactically, it worked well. In addition to anecdotal feedback, the Army is also gathering empirical evidence that the ISS-S will improve soldier performance. 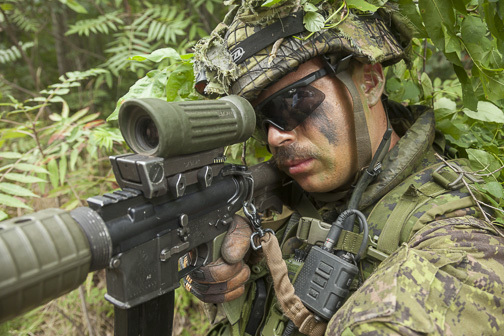 As part of the Soldier S&T Program, Defence Research and Development Canada (DRDC) is conducting the Future Soldier Technologies Trial 2018 with 3 RCR. The trial involves three studies assessing soldier movements under load and the benefits of varying body armour coverage and load carriage designs; the value of various small arms full and partial fire control systems on unknown distance shooting and moving target engagements; and individual and small team performance comparing the ISS-S to the baseline kit soldiers had in Afghanistan. 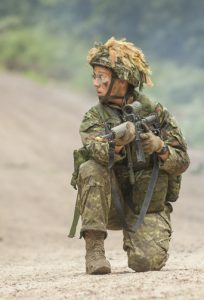 “[This is] our first opportunity to objectively assess the impact of ISS-S on soldier and team effectiveness,” said Linda Bossi, a defence scientist with DRDC in Toronto leading the trials. For the ISS-S comparison, individual and small teams of soldiers were tasked with planning and executing a route while adapting to barriers such as a minefield; searching an operational area for an evading enemy or downed aircrew; mission planning and giving orders; and executing a mission from multiple insertion points. If early observations are any indication, the ISS-S offers an extraordinary improvement. “Anything the sections did in ISS-S was a fraction of the time it took without ISS-S,” she said. With the baseline kit of a map, compass, personal role radio, and DAGR for the section commander, soldiers had a far more difficult time with each task, often failing to complete it in the allotted time. Wayfinding, for example, was conducted in dense brush lacking obvious landmarks to aid in navigation. “In the non-ISS condition, the task was slowed by the need for frequent compass checks, inaccurate pace counting, and insufficient consultation of the DAGR (to know their precise location) perhaps due to overconfidence in their own abilities,” Bossi said. In one instance, a soldier failed to box a [virtual] minefield and ended up walking through it twice. In the search for enemy or downed aircrew, ISS allowed the team to disperse and operate more effectively, the leader redrawing and sending course changes as the target moved, to affect a quick capture. Without the ISS-S, the search team never came close in the dense brush. For mission planning and giving orders, Bossi noted the baseline approach of receiving, writing down and confirming orders is time consuming, and at times resulted in plotting errors because of incorrect grid location information, which in turn led to searches in the wrong area during mission execution. With ISS-S, commanders were able to insert orders into a template, complete with scratch drawings and map overlays, and teams were then able to find and engage the enemy within minutes. “When you have a digital map that has accurate blue force tracking and you can enter and distribute to the team an enemy location, you can move fast and accurately, ensuring mission success every time,” she observed. The findings are only preliminary and were limited to small team tasks, not company operations. And study participants and senior officers visiting the trial also raised questions about the electromagnetic signature the system will create. The next steps in the trial will focus on identifying changes that could improve the system, and participating in capturing lessons learned in upcoming larger live fire exercises that could have bearing on the tactics, techniques and procedures for the ISS-S.
Nobody is paying more attention to the feedback than Major Christopher Guilbaud-McHarg. 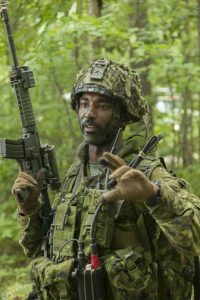 A hard-charging infantry officer with the Royal 22e Regiment (R22eR), who became the new ISS-S project director this summer, he’s determined to see cycles two and three deliver a final product that is world class. Guilbaud-McHarg acknowledged the Argus system currently being introduced to the 3 RCR – and in late November to 2 Battalion, R22eR – is the “initial version” for soldiers to “sink their teeth into.” After gathering user feedback, he met with the prime contractor, Rheinmetall Canada, and said the statement of requirements (SOR) for the second cycle is being fine-tuned, even as he prepares to draft the SOR for the third cycle in June 2019. The aim of Cycle 2 will be a software upgrade of the current system and the addition of more sensors, including possibly a laser range finder, a camera, a DAGR and a more advanced radio. The project will also bridge the gap with the Army’s Land Command Support System (LCSS), its battle management network – a challenge that must resolve data sharing across secure and unsecure networks. “We’re listening to [National Defence] and supporting them to define the next step in regards to the evolution of the equipment,” said Daniel Riquier, Rheinmetall’s project manager. While the requirements for the next two cycles will come from the Army, he said the company had been gathering feedback from its own instructors, who have been providing the initial train-the-trainer program. “Receptivity is very high,” he said, but it would take time to introduce and resolve issues with a capability the Army has never had before. “Argus was designed to be very … easy to use. It doesn’t require a long training period. The handheld device is not a mobile phone, but it is very similar in the way it looks, the graphics, how the widgets are displayed, where the buttons are placed,” he said, adding that the system had to meet very “stringent” tests before it could be fielded. Rheinmetall was awarded the ISS-S contract in 2015, valued at over $40 million with follow-on in-service support, to deliver around 4,000 Argus systems, which comprise a Harris radio, Saab tactical display computer and hub, Invisio push-to-talk headphone, battery pack and network integration. Riquier said about 1,500 systems had been delivered as of October and almost 3,000 would be fielded by mid 2019. Discussions were ongoing about capabilities for the next cycle, but he offered two possibilities for consideration: control and access to the video feed of a UAV, and integration of night vision systems. “We’ll see how it fits into their roadmap,” he said. Among the many considerations for Guilbaud-McHarg will be interoperability, not only with the LCSS modernization project, but also with training systems such as the weapon effects simulation (WES) upgrade, the newly acquired digitally-aided close air support system (DACAS) for forward observers and air controllers, and the vastly more capable LAV 6.0 with which the infantry will interact. And, of course, the battery, which was based on an SOR written in 2011. “Technology has changed,” he said. Both Guilbaud-McHarg and Riquier noted that while the Argus is fairly basic in Cycle 1, it has allowed the Army to introduce a capability that appears to be a more effective system than those currently fielded by allies. 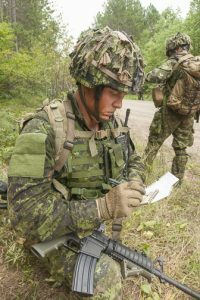 “I don’t know if we are the arrowhead, but we certainly have one of the best soldier systems out there,” said Guilbaud-McHarg. And he’s probably the right person to see it through. In 2015, he was awarded for his leadership as director of Exercise Frontier Sentinel, the largest joint/combined interagency counterterrorism exercise that the Royal Canadian Mounted Police has ever executed, involving over 10 government departments and military agencies from the U.S. and Canada. “They give me the projects that I can put some horsepower into,” he joked.